Well, not really. But there’s definitely a connection between that soft and gentle creature and the obelisk commemorating the first major, fiercest, and bloodiest battle of the Revolutionary War. Construction of the Bunker Hill Monument started in 1825. They built one of America’s first railroads to carry the eight-ton blocks of granite from the quarries south of Boston. 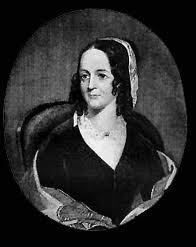 But funds ran out and it took a remarkable woman named Sarah Josepha Hale to rescue the project. Hale was editor – she preferred to be called “editress” – of The Ladies’ Magazine. She’d also published, in 1830, Poems for Our Children, a collection that included Mary’s Lamb. She raised $30,000 for the completion of the Monument. She first asked her readers to donate a dollar each and also organized a week-long craft fair at Quincy Market. The fair sold handmade jewelry, quilts, baskets, jams, jellies, cakes, pies, and autographed letters from George Washington, James Madison, and the Marquis de Lafayette. Without Mrs. Hale, the 221-foot monument might never have been built. 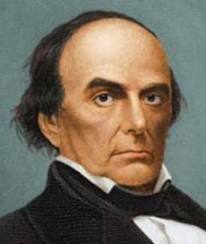 Daniel Webster had addressed a crowd of 100,000 at the laying of the cornerstone. He was still around in 1843, and he spoke again when the finished monument was dedicated that year. It is one of the signature edifices of Boston, a memorial both to the fighting spirit of the colonists and to the staunch patriotism of Sarah Josepha Hale. As the latest Smithsonian magazine tells it, there’s a lot of mythology about both colonial Boston and the Battle of Bunker Hill. The city was no cradle of liberty or bastion of religion. Though founded by Puritans, Boston had a neighborhood near Beacon Hill that was so thick with prostitutes that maps showed it as “Mount Whoredom.” One out of five families in Boston owned slaves. The city was viciously divided between Loyalists and advocates of independence. Many of the “Sons of Liberty” were vigilantes and thugs. It had been two months since the skirmishes at Lexington and Concord. The Brits were holed up in the city of Boston, and the colonists were on the outskirts. Fortifying Breed’s Hill, which was closer to the city than Bunker Hill, was probably done as a deliberate provocation. It worked. The British responded, torched Charlestown at the base of the hill, and attacked the entrenched colonials. The Brits, with their red uniforms and the nattily-dressed officers easily identifiable and thus prime targets, charged twice and were beaten back. The high grass had obscured many rocks, holes and other obstacles that made the uphill advance even more difficult. The third charge was different. They first blasted the hilltop with cannon fire, then marched in spaced columns rather than abreast. There was no “whites of their eyes” command by Colonel William Prescott or General Israel Putnam. That was made up years later by writer Parson Weems, who also concocted the story of George Washington and the cherry tree. When the British charged, the Americans fired from 50 yards away. One colonel told his men not to shoot until they saw the splash guards, called half-gaiters, which the soldiers wore around their calves. “Don’t fire until you see their half-gaiters” just doesn’t sound the same, does it? The Americans ran out of ammunition. Those who couldn’t escape perished in brutal, hand-to-hand combat. The British took the hill top, but had suffered 1,054 casualties to the Americans’ 400. “Success is too dearly bought,” wrote British General William Howe, who lost every member of his staff and the bottle of wine that his aide-de-camp had brought along. The British got the message: the colonists, though driven off Breed’s Hill that day in June, were going to give them a tough fight. In March 1776, just nine months later, the redcoats evacuated the city of Boston for good. The first monument on the Breed’s Hill site was an 18-foot wooden pillar with a gilt urn erected in 1794 by King Solomon’s Lodge of Masons. They wanted to honor Dr. Joseph Warren, a physician and Mason who was the Revolution’s first martyred hero. There’s a statue of him in Charlestown now, but he is little remembered today. 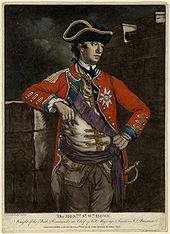 Warren was a leader of the colonial underground, and he became a major general of the army in the time leading up to Bunker Hill. Clad in a toga, he addressed a crowd of 5,000 before the battle. He didn’t assume a command, but fought as an ordinary soldier. He wore a silk-fringed waistcoat with silver buttons, and he died from a bullet in the face during the final British charge. 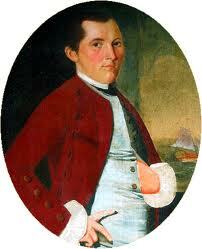 Warren’s stripped body was later found and identified through his false teeth, which had been crafted by Paul Revere. He left behind both a fiancée and a pregnant mistress. In 1823, a group of prominent citizens formed the Bunker Hill Monument Association to put up a better memorial. They fell short of their goal, though, and had to be rescued by Sarah Josepha Hale and Mary’s Little Lamb. History shows that France formally entered an alliance with the Americans after the army of Horatio Gates defeated the redcoats of John Burgoyne at the Battle of Saratoga. The books don’t tell that our boys were wearing uniforms and firing guns delivered by 20 French ships manned by sailors organized and paid by the firm of Roderigue, Hortalez and Company. That company was a front, set up by Beaumarchais, which would have made the CIA proud. Secretly backed by the governments of France and Spain, Roderigue, Hortalez purchased and shipped to America: 200 cannon; mortars; 25,000 firearms and ammunition; 200,000 pounds of gunpowder; and uniforms and camping equipment for 25,000 men. The whole thing was done without the British ambassador to France catching wind of it. King Louis XVI had wanted to support the Americans against the Brits, but he wanted to do it clandestinely. Beaumarchais got the cooperation of admirals and factory owners by issuing many orders in Louis’ name, orders that the king never knew about. 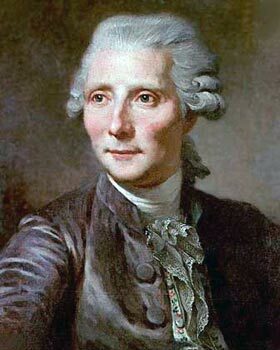 When he heard the news of the American victory at Saratoga, Beaumarchais sped off for Paris in a carriage to tell the king, and he suffered a serious injury in an accident along the way. Beaumarchais had to borrow the money to finance the arms shipment. 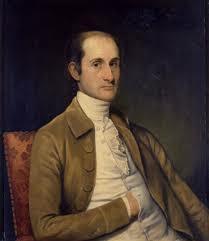 He was to be paid in tobacco, according to his deal with Silas Deane of Connecticut, who was then acting as agent for the Continental Congress. Deane was a slippery character. He didn’t keep his financial records in order, for whatever reason, and was eventually fired from the job in France and replaced by John Adams. Deane ended up advocating for the British cause and living in Europe. Merci beaucoup, Chief Justice. Show me the money! 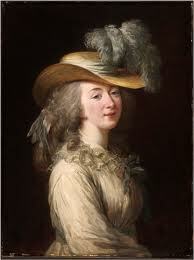 Forty years on, Beaumarchais’ daughter had fallen into poverty. She petitioned Congress to pay the 2.25 million francs that America still owed her father, according to books originally compiled by Alexander Hamilton. Congress told her to take one-third of the amount, or nothing. The American nation is not the only one that owes M. Beaumarchais its thanks. So do opera fans and literature buffs of all nations. He wrote the plays that eventually made into The Barber of Seville, The Marriage of Figaro, and The Guilty Mother. He also went into the publishing business in Germany and printed many of the works of Voltaire, which were banned in France. Without Beaumarchais’s publishing ventures, unprofitable though they were, we might not know much at all of that great author Voltaire. 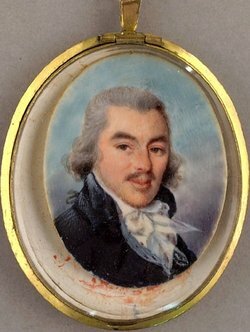 How did Beaumarchais, son of a middle-class provincial watchmaker, achieve all that he did in and around the royal courts of France? It took a brew of talent, native intelligence, hard work, and a knack for bettering himself through networking and marrying rich women. Watches were unreliable and worn mostly for ornamentation back then. At age 20, Beaumarchais invented an escapement for the internal works; the escapement made his watches much more accurate. He also designed a watch mounted on an elegant ring. 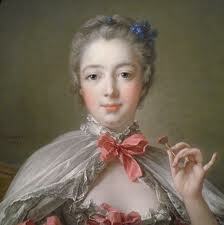 The watch was for Mme de Pompadour, mistress of King Louis XV. That was his entrée to the court at Versailles. Beaumarchais became a harp instructor to Louis XV’s daughters. He married a second time, bought himself a title and coat of arms, and collaborated with some big French wheeler-dealers on ventures like the building of the Royal Military Academy. He also tried to be named the exclusive exporter of slaves to the French colony of Louisiana. He fell out of favor when his wealthy patron Joseph Paris Duvereney died, and he got embroiled in a sensational lawsuit known as the Goezman affair. Both Beaumarchais and his opponent tried to bribe the judge, whose name was Goezman. Beaumarchais’s writings about the case were popular, scandalous faire. The verdict was basically a tie, and Beaumarchais ended up losing his civil rights. He earned those rights back by going to England as Louis XV’s secret emissary. 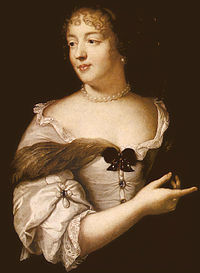 His task: to buy off a blackmailer who was threatening Countess du Barry, another mistress, with a defamatory book named Les mémoires secrets d’une femme publique. He succeeded brilliantly, getting 3,000 copies of the book burned. He persuaded the author to become a valuable informant for the French. Later on, during the French Revolution, Beaumarchais made big money by supplying the City of Paris with water. He had to flee for his life and spent a couple years in Germany before returning and living out the rest of his days. He married a total of three times, and his enemies accused him of poisoning his first two wives in order to gain access to their money. Whether he ever did so was never proven. But one thing was certain: he did have a talent for wooing wealthy ladies. Pierre Augustin Caron de Beaumarchais deserved more than the mere esteem of this infant republic. We should be including him in any serious accounts of how the American colonies were able to win their war of independence. Belated applause too, please! And come on now – admit it. Isn’t history just fascinating? As far as I’m concerned, the NCAA Division One hockey championship game will be one of those clichéd contests where it’s too bad that one of the teams has to come out as the loser. There’s ample reason to cheer for Quinnipiac or Yale. And whichever one wins, we can feel good that two teams from the ECAC are going at it for the national title. This hasn’t happened since BU 5, BC 3 in back in 1978 when there was just one major college hockey conference in the East. 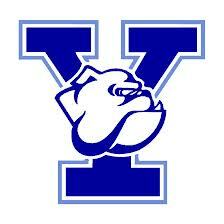 I’d like to see Yale prevail to show that student-athletes can win a national championship in college hockey. One of the TV commentators said that Yale has never won a national title in anything. Perhaps the Elis were the best college football team in the land in the days of Walter Camp and Pudge Heffelfinger. But they didn’t have NCAA championships back in those days. Yale – like all of its fellow Ivy League institutions – would never stand a chance of going all the way in football or basketball, so it would be good to see them make it happen in hockey. They’ve not had a great deal of success in hockey over the years, and only once before, in 1952, did they even make it to the NCAA’s semifinal round. Coach Keith Allain has done a great job in New Haven. 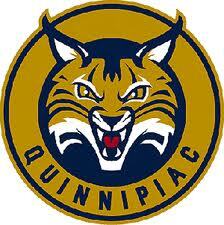 I’d like to see Quinnipiac prevail for two reasons. First, this is a school that has come out of nowhere to national prominence in hockey. They’ve invested in the program and supported Rand Pecknold and his coaching staff all through the team’s rise. Not all colleges will make that kind of commitment. Hockey is expensive, and it will never bring in the television-related revenues of basketball and football. You must choose to make hockey an important part of your school’s culture, and you must be prepared to reap comparatively modest financial returns. Bravo to the schools that do so, and to Quinnipiac for being the latest. They can thank athletic director Jack McDonald for making it happen. The second reason is personal. I’ve known Jack for many years. He is BC ’73, a Hall of Fame track man, and a superb human being. He worked in the athletic department at BC and had a successful tenure as A.D. at Denver before coming to Quinnipiac. It’s wonderful to see his vision and determination pay off. 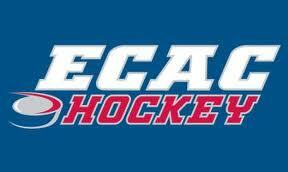 Twenty-nine years ago, ECAC Division One was the only hockey conference that mattered in the East. There were 17 teams and three divisions – East, West, and Ivy. The scheduling was uniform, at long last, and the politics of playoff qualification were finally a thing of the past. “The ECACs” were the best hockey weekend of the year, period. Then the Ivy league schools decided that they did not want to subject themselves to games with every one of those teams from the Great Unwashed. I was covering the sport for the Hockey News at the time, and I could never get anyone from the schismatic six to return a phone call or give an adequate explanation. It appeared that Princeton was the prime mover, and they were conveniently removed from the Boston media and could easily fend off inquiring reporters. Fortunately for the Ivies, they were able to persuade Clarkson, Saint Lawrence, and RPI to stick with them instead of going over to the league that eventually became Hockey East. I heard it took a special appeal from Ivy presidents to their counterparts. Had it gone the other way, Ivy League hockey might have atrophied into a Division Two backwater. But the ECAC remained viable even though Hockey East has been vastly more successful on the national level in the almost three decades since then. I’m still angry at those people, but they’re long gone. So bravo to the coaches and players of the current ECAC generation, and to the league’s classy commissioner Steve Hagwell. They are doing Eastern hockey proud. I maintain to this day that the ECAC-Hockey East split was unnecessary and driven largely by Ivy snobbery. Some fabulous rivalries of bygone days have died off. I can only speak as a BC fan here, but I say that it’s terrible that my team rarely if ever plays Cornell, Brown, St. Lawrence, or Clarkson. There is absolutely no reason that ancient rivals BC and Harvard not have a game every year, but they don’t. Ditto for Eagles’ games with Yale and Dartmouth. I like the intensity and the quality of Hockey East competition, but three regular-season games with each league rival are too many. With Notre Dame joining Hockey East next season, they’ll have to cut back to two Hockey East league games apiece. This should open up more available dates for the continuation or resumption of some the fine, old rivalries. We’ll probably see Penn State’s new team playing a few games in this area too, and more as time goes on. Will there ever be a formal merger, a recombining, of ECAC and Hockey East? Doubtful, but not needed, especially if we see a few more interleague games along the way. In a way, there’s already one big national conference anyway. The pairwise rankings and power ratings pit your team against those of all conferences. The tougher your schedule, the better. Non-league games count as much as league matchups in figuring eligibility for the 16-team national tournament. Everyone knows what it takes to make it into that dance. All good stuff. I can’t end without a tip of the fedora to UMass Lowell. They were almost left for dead five or six years ago but have come all the way back and then some. It started at the top when Marty Meehan took over the reins at the school. It took more than a little lobbying with the Trustees by Marty and a number of others to keep UML in the big time. Hiring Norm Bazin to coach was a stroke of genius, or luck, or both. The River Hawks were a jewel of consistency ever since January and all through the playoffs. They laid an egg against Yale, but they’ll be back. Like Quinnipiac, they’ve made the institutional commitment to the sport of hockey, and we’re better off for it. And lastly, I want the Frozen Four to be a regular event at the TD Garden in Boston. It belongs back here, perhaps one year out of every four or five. Play the game of hockey in hockey cities, guys. Back in the old days, people thought that illness was the result of imbalances of the four “humours” within the body. “Bleeding” to correct those imbalances was standard treatment. 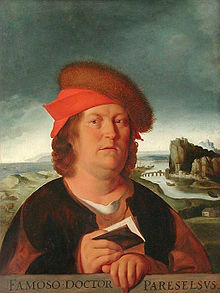 Paracelsus (1493-1541) first challenged this view by stating that poisons from outside the body made people sick. Introducing other “poisons,” albeit in smaller doses, could correct things. In America, the preacher Cotton Mather was a big supporter of the practice, but the only physician to adopt it was Dr. Zabdiel Boylston (1676-1766) of Brookline, Massachusetts. Boylston performed America’s first successful operation for the removal of bladder stones in 1710. In 1718, he did the first surgical removal of a breast tumor. The “big pox,” or syphilis, was all too common as well. Dr. Thomas Dover (1660-1742) thought that mercury was the cure for syphilis. He prescribed mercury for that and for other venereal diseases and became known as “Dr. Quicksilver.” His “Dover’s Powder,” a concoction of ipecac, opium, and potassium sulfate, was used to induce sweating to defeat the advance of a “cold” and at the beginning of an attack of fever. It remained in use up to the 1960s. Thomas Dover was an interesting guy. He gave up his medical practice and sought his fortune in privateering, even though he was a landlubber. On a three-year voyage of that legalized piracy he managed to make that fortune and put down a mutiny along the way. He was also the captain who rescued and brought home Alexander Selkirk, who’d been marooned on an island off Chile. 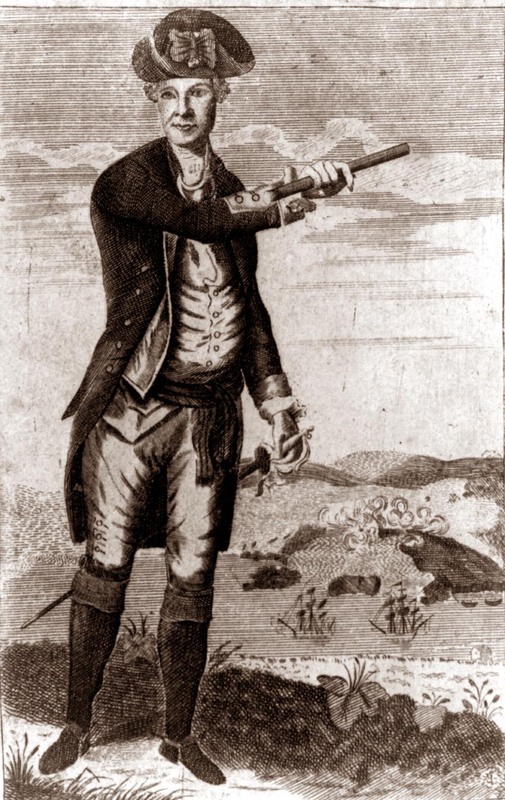 Selkirk’s story was retold in fiction by Daniel Defoe in Robinson Crusoe. 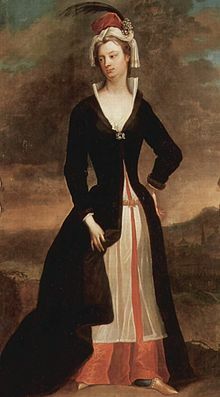 Dover, like Lady Montagu, was a disciple of Paracelsus and a believer that diseases originated outside the body. That growing realization led to support for additional preventive medical techniques. Venereal disease was one affliction that simply cried out for methods of prevention, especially in military circles. The troops of the British Royal Guard suffered more deaths from sexually-transmitted diseases than from enemy swords and bullets. A small company was founded in 1880 to produce the booties that were named for the intrepid colonel. In 1937, the first latex version of the bootie made its appearance. The company named the new product a “Trojan” in honor of the walls of Troy, which had been so effective on holding the Greeks at bay for ten years. The more formal name of the product is “prophylactic,” derived from the Greek words “pro” (for) and “phylax” (gatekeeper). And that’s our history lesson for today. You are currently browsing the Veteranscribe's Blog blog archives for April, 2013.